Here is the list of the hotels near Hodent. Book your hotel near Hodent today, Thursday 16 May for the best price, reservation and cancellation free of charge thanks to our partner Booking.com, leader in on-line hotels reservation. Below here is the list the 50 closest hotels of Hodent, sortable according your criteria. You will find the position of these accommodations on the Hodent hotels map. Set in Omerville, 48 km from Versailles, La Musardine en Vexin boasts a sun terrace and views of the garden. You will find a kettle in the room. Rooms are fitted with a private bathroom. Extras include free toiletries and a hair dryer. La Musardine en Vexin features free WiFi throughout the property. Upon prior booking and at an extra cost, evening meals are available at the property. A number of activities are offered in the area, such as golfing and cycling. Beauvais is 43 km from La Musardine en Vexin and the nearest airport is Paris Beauvais-Tille Airport, 46 km from La Musardine en Vexin. Classified as an Historic Monument since 1947, Château de Maudetour is 10 km from the centre of Maudétour-en-Vexin. It offers antique-style furniture, free Wi-Fi access and a garden. A shared living room is available. All rooms feature garden views, a flat-screen TV and wooden floors. The private bathroom includes free toiletries, a hairdryer and a bath or shower. Guests are invited to enjoy a buffet breakfast every morning at Château de Maudetour. Evening meals can also be served in the dining room. A sauna and a fitness area are available at an extra cost. This property is 16 km from Mantes-la-Jolie and free private parking is available on site. Set in a renovated 18th-century building, the B&B Au Relais de Chaussy is only 2 km from Villarceaux Golf Club. Home-grown fruits and vegetables are prepared for breakfast and for dinner. Decorated with wooden furniture and parquet flooring, the rooms offer a view of the garden or courtyard. Each has an electric kettle for making hot drinks, and the bathroom includes a hairdryer. Some have an LCD TV. Breakfast consists of homemade jams, yogurts, cakes and bread, and it is taken in the communal dining room. After breakfast, you can relax in the shared lounge, which has a fireplace, TV and board games. Magny-en-Vexin is 8 km from this B&B and it is 16 km from Giverny, where you can visit Claude Monet’s house. Free private parking and a secure garage for bikes are available on site. The property is set on the cycling path linking Paris and London. Apartment Aincourt Preferred hotel ! Offering free WiFi and garden views, Villa 1930 is an accommodation set in Aincourt. Guests staying at this apartment have access to a fully equipped kitchen. This 4-bedroom apartment includes 1 bathroom equipped with a bath. A TV is offered. Guests can also relax in the garden. Versailles is 47 km from the apartment. Paris Beauvais-Tille Airport is 69 km from the property. Hotel Bray-et-Lû Preferred hotel ! Located 35 minutes from the outskirts of Paris and 14 km from Giverny, Hotel Les Jardins d'Epicure offers a swimming pool, hot tub, sauna and hammam. Hotel Les Jardins d'Epicure features elegant rooms and suites set in three charming buildings, including the former stables. Each room and suite has a unique decor and offers all modern facilities. You can savour a meal in the hotel's gourmet restaurant, which serves delicious and refined cuisine prepared using fresh, local ingredients. Located in Dampsmesnil, Ravissante Maison au Coeur du Vexin Normand offers a self-catering house with 2 gardens, table tennis and BBQ facilities. Château et Domaine d’Ambleville is only a 10-minute drive away. The property features 1 main building and 1 annex building separated by a garden. Guests have access to a living area with a fireplace and TV, a washing machine, tumble dryer and 2 bathrooms. The kitchen includes an oven, microwave and dishwasher. Supermarkets and restaurants can be found in Vernon, a 25-minute drive away and free Wi-Fi access is provided throughout. Magny-en-Vexin is a 15-minute drive away and Château de la Roche-Guyon is 12 km from the property. Guest accommodation Breuil Preferred hotel ! Located in Breuil in the Ile de France region, La Source has a terrace and garden views. This holiday home offers free WiFi, a tennis court, as well as barbecue facilities. The holiday home features 4 bedrooms, a living room, and a kitchen with a dishwasher. A flat-screen TV with satellite channels is offered. There is a garden at this property and guests can go fishing and hiking nearby. Beauvais is 44 km from the holiday home. The nearest airport is Paris Beauvais-Tille Airport, 54 km from the property. Chambres d'hôtes Villa de Vienne-en-Arthies is located in Vienne-en-Arthies. This traditional-style guest house offers a large garden with a terrace and a living room with parquet flooring, stone walls and exposed beams. With a garden view, the 4 uniquely-decorated rooms here will provide you with a flat-screen TV. Featuring a spa bath or a walk in shower, the bathrooms also include a hairdryer. Guests also have access to a shared kitchen with a fridge, a microwave, a stovetop and an oven. A continental breakfast is provided every morning and the owners can advise you on several restaurants in the surroundings. For guests who enjoy hiking, a hiking trail can be found on site and the property offers free bike rental services. This guest house is 18 km from Giverny and Claude Monet Museum. It is also 8 km from Roche-Guyon Castle and a 15-minute drive from Aventureland Attraction Park. La petite Ferme is a bed and breakfast located in Chérence, 61 km from both Versailles and Beauvais. Free WiFi is available throughout this former farmhouse and free private parking is available on site. Certain units feature a seating area where you can relax. If you reserve in advance, you can play tennis at this bed and breakfast, and the area is popular for canoeing and hiking. The nearest airport is Paris Beauvais-Tille Airport, 64 km from La petite Ferme. Maison De Vacances - Dampsmesnil is located in Écos and offers barbecue facilities. Complimentary WiFi is offered. This holiday home features a living room and a fully equipped kitchen with a dishwasher and an oven. A TV is provided. The holiday home offers a terrace. Guests can also relax in the garden. Cergy is 39 km from Maison De Vacances - Dampsmesnil. Paris Beauvais-Tille Airport is 63 km away. 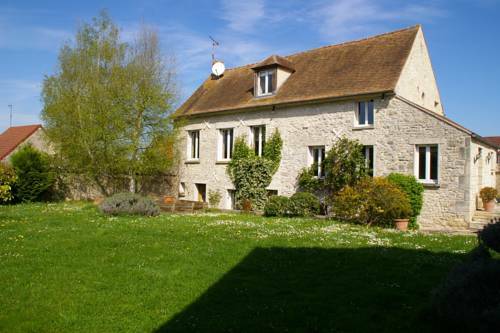 En Bord de Seine features accommodation with a garden and free WiFi, and is situated in Vétheuil. A terrace with river views is offered in each unit. Breakfast is available daily, and includes continental and vegetarian options. The bed and breakfast offers a children's playground. Fishing and hiking can be enjoyed nearby. Paris Beauvais-Tille Airport is 78 km away. Bed and Breakfast Vétheuil Preferred hotel ! Set in the Vexin Natural Regional Park, Escale chez un Impressionniste is a B&B that offers accommodation in Vétheuil, 15 km from Giverny. Claude Monet lived in this house from 1878 to 1881 and painted more than 150 paintings there. The property is decorated in a 19th-century style. Featuring a 19-century interior design with paintings and wooden floors, the rooms have facilities for making coffee and tea. The private bathroom includes slippers and free toiletries. Breakfast is served every morning in the breakfast room. There is a common lounge at guest's disposal. An array of activities are offered in the area, such as canoeing and hiking. Carriage rides can be arranged upon request. The property is located 9 km from the London-Paris cycle route and guests can use the bicycle storage area. Versailles is 57 km from Escale chez un Impressionniste while Paris Beauvais-Tille Airport is 60 km away. Guest accommodation Moisson Preferred hotel ! La Sequana offers pet-friendly accommodation in Moisson. Free private parking is available on site. Rooms come with a private bathroom equipped with a bath or shower. La Sequana features free WiFi . You can engage in various activities, such as hiking and cycling around La Boucle de Moisson Nature Reserve. Claude Monet Foundation is 17 km from the property and Roche Guyon Chateau is 16.8 km away. Holiday home Rue du Val Corbon is set in Fourges and offers barbecue facilities. This holiday home offers accommodation with free WiFi. The holiday home comes with a satellite TV. The kitchen has a dishwasher and an oven. Guests can enjoy the indoor pool at the holiday home. Cergy is 39 km from Holiday home Rue du Val Corbon, while Évreux is 48 km from the property. Paris Beauvais-Tille Airport is 67 km away. Guest accommodation Montalet-le-Bois Preferred hotel ! Set in Montalet-le-Bois, Villa Gaeta provides accommodation with free WiFi and access to a garden with a terrace. A patio with garden views is offered in all units. Guests can also relax in the shared lounge area. Paris is 50 km from the country house, while Versailles is 40 km away. Paris - Orly Airport is 64 km from the property. Set 48 km from Versailles and 10 km from Giverny, Sci De L'ile Frion offers accommodation in La Roche-Guyon. The property is 47 km from Nanterre and free private parking is available. Free WiFi is offered throughout the property. A TV is provided. Other facilities at Sci De L'ile Frion include a barbecue and outdoor furniture. Saint-Germain-en-Laye is 39 km from Sci De L'ile Frion, while Cergy is 30 km from the property. The nearest airport is Paris Beauvais-Tille Airport, 55 km from Sci De L'ile Frion. Le Logis du Château is a self-catering accommodation located in La Roche Guyon. Free WiFi access is available. The property is 4.1 km from Moisson Golf. Accommodation will provide you with a seating area and a TV with satellite channels. There is a full kitchen with a microwave and a refrigerator. Featuring a shower, private bathrooms also come with a hairdryer and free toiletries. You can enjoy city view. Charles De Gaulle Airport is located 67 km away. La Cachette de la Roche-Guyon offers accommodation in La Roche-Guyon, 9 km from Giverny and 48 km from Versailles. Free WiFi is offered . A dishwasher and an oven can be found in the kitchen. Towels and bed linen are available in this apartment. Rouen is 71 km from La Cachette de la Roche-Guyon, while Cergy is 30 km from the property. A range of activities are offered in the area, such as golfing, horse riding and fishing. The nearest airport is Paris Beauvais-Tille Airport, 55 km from the property. Featuring accommodation with a private pool, pool view and a terrace, Le clos des charmelines is situated in Fours-en-Vexin. Complimentary WiFi is offered. The holiday home includes 1 bedroom and a kitchen with a microwave and a coffee machine. A TV is provided. Cergy is 45 km from the holiday home, while Évreux is 48 km from the property. The nearest airport is Paris Beauvais-Tille Airport, 64 km from Le clos des charmelines. Located in Gasny, B&B Les Agapanthes is 6 km from Giverny and Claude Monet’s House. It offers a garden, free WiFi and a shared lounge. Bikes can be borrowed from the property. Decorated in neutral tones, all rooms feature exposed beams, wooden floors and facilities for making coffee and tea. The bathroom is complete with free toiletries, a hairdryer and a shower. A continental or English breakfast is served every morning at B&B Les Agapanthes. It can be served on the terrace. This property is 10 km from Vernon and 22 km from Mantes-la-Jolie. Free public parking is available on site. Camping Loisirs Des Groux provides accommodation with a kitchen, located in Mousseaux-sur-Seine. Complimentary WiFi is offered. Each unit is fitted with a microwave, fridge, a coffee machine, as well as a stovetop and kettle. There is a seating and a dining area in all units. A continental breakfast is available every morning at the camping. If you would like to discover the area, fishing is possible in the surroundings. The nearest airport is Paris - Orly Airport, 87 km from CAMPING LOISIRS DES GROUX. La Ferme Des Impressionnistes offers accommodation in Gasny, only 5 km from the city of Giverny and the famous Fondation Claude Monet. Free private parking is available on site. Certain rooms include a seating area where you can relax. All rooms are equipped with a private bathroom fitted with a bath or shower. You will find a cash machine at the property. You can play table tennis and billiards at this bed and breakfast, and free use of bicycles is available. Evreux is 42 km from La Ferme Des Impressionnistes, while La Roche Guyon is 3 km away. Beauvais Tille Airport is 70.5 km from the property. Located just 2 km from Claude Monet’s House in Giverny, Gîtes de L’Oasis offers self-catering apartments with BBQ facilities and a garden. La Roche Guyon Castle is only 4 km away. All apartments feature a balcony, a living area with a flat-screen TV and DVD player, a wardrobe in the bedrooms, a washing machine and a bathroom. The kitchen includes a microwave, stove and refrigerator. Supermarkets and restaurants can be found within 2 km of the property and guests can also have a breakfast basket with pastries, marmalade, bread and fruit juice, upon request a day in advance. Additional features include free Wi-Fi access throughout and free private parking on site. Vernon Train Station is 7 km away and the A15 motorway is ideally located 15 km from the apartments. La Roseraie guesthouse is located in the village of Sainte-Geneviève-lès-Gasny, 3 km from The Monet Gardens in Giverny. It features a covered outdoor swimming pool set in 3000 m² of landscaped gardens. This guesthouse offers rooms with en suite bathrooms in 2 separate buildings, each with a private entrance. Suites at La Roseraie have an equipped kitchenette with a seating and dining area. Free WiFi is provided in the main house and in some rooms. Breakfast is served every morning in the main house upon request. There is a terrace area beside the swimming pool with BBQ facilities and a children’s playground with a swing and slide. Vernon Train Station is 9 km away and the Château de La Roche-Guyon is 5 km from the guesthouse. Guests are invited to enjoy the guesthouse’s rose garden, and free private parking is available on site. Bed and Breakfast Seraincourt Preferred hotel ! Le Relais De Dalibray is situated in Seraincourt and features barbecue facilities and a garden. The property has a terrace, as well as a shared lounge and a meeting room. Free WiFi is available and in-house parking is provided. At the bed and breakfast, all rooms include a wardrobe and a flat-screen TV. All rooms are fitted with a private bathroom with free toiletries, while selected rooms come with a kitchenette with an oven. A continental breakfast is served every morning at the property. A variety of popular activities are available in the area around Le Relais De Dalibray, including golfing, cycling and hiking. Paris is 40 km from the accommodation, while Versailles is 31 km away. The nearest airport is Paris - Orly Airport, 49 km from the property. Featuring free WiFi throughout the property, Ma Cambuse offers accommodation in Sainte-Geneviève-lès-Gasny. Free private parking is available on site. You will find a coffee machine and a flat-screen TV in the seating area. The entire floor of the property is at guests' disposal. A number of activities are offered in the area, such as cycling and canoeing. Giverny is 4 km from the property. The nearest airport is Paris Beauvais-Tille Airport, 57 km from the property. Located 2 km from Giverny, this guest accommodation is surrounded by fruit trees in the 2000m² floral garden. It offers individually decorated rooms with antique furniture and a private bathroom. Massage treatments are available upon request and guests can go kayaking nearby. All rooms at Aux Marguerites feature a view and a work desk. Some rooms have an elegant 18th-century style décor, and free Wi-Fi access. The studio features a contemporary décor and has a private bathroom. It is equipped with a minibar, a TV and radio. The kitchen is fully equipped with a microwave and a fridge. The studio also features a terrace with deck chairs and a hammock. Breakfast is served every morning at the guest house Aux Marguerites. With free private parking on site, Aux Marguerites is located 3 km from La Roche Guyon. The river is 50 metres away for guests wishing to go fishing. Bikes for adults and children are available to borrow. Chalet Marika is situated in Haricourt. The accommodation features free WiFi. This chalet has 1 bathroom with a bath, a shower and a hair dryer. The kitchen is fitted with a dishwasher. Cergy is 46 km from the chalet. The nearest airport is Paris Beauvais-Tille Airport, 74 km from the property. This 2-star hotel is situated in Gisors, just 600 metres from the Château de Gisors. It offers modern accommodations equipped with free Wi-Fi and a meeting room. Gisors Train Station is a 2-minute walk away. All of the soundproofed rooms at Hôtel Moderne have a unique décor. Each room features a TV with satellite channels, a desk and a private bathroom with free toiletries. Every day, the hotel serves a buffet breakfast. Private parking is provided on site at an extra cost and Beauvais is 30 km from the hotel. Two-Bedroom Holiday Home in Trie Chateau is located in Trie-Château. Free WiFi is offered. The holiday home has 2 bedrooms and a fully fitted kitchen with a dishwasher and a microwave. A TV is available. Beauvais is 32 km from the holiday home, while Forges-les-Eaux is 45 km from the property. The nearest airport is Paris Beauvais-Tille Airport, 42 km from Two-Bedroom Holiday Home in Trie Chateau. Surrounded by a big garden, Château de la Folie is located in Trie-Château. It provides free WiFi access, a children playground and free private parking. With parquet floors and garden view, each room here will provide you with a TV, minibar and a coffee machine. The private bathroom comes with bathrobes and free toiletries. At Château de la Folie you will find a terrace and a shared lounge. An array of activities can be enjoyed on site or in the surroundings, including cycling. Paris - Charles de Gaulle Airport is 63 km away. Situated in Trie-Château, Le Village des Templiers features accommodation with a hot tub. Free WiFi is featured. The units have a fully equipped kitchen with dining area, a dishwasher and an oven. There is a private bathroom with hot tub and free toiletries in each unit, along with a hair dryer. The bed and breakfast offers a barbecue. Guests can relax in the garden at the property. Beauvais is 32 km from Le Village des Templiers, while Forges-les-Eaux is 45 km from the property. The nearest airport is Paris Beauvais-Tille Airport, 42 km from the accommodation. Offering a restaurant and a flowered garden, Le Pingouin is located in Bennecourt. You can relax in the shared lounge or on the terrace, enjoy the games room and use the free WiFi connection. The holiday home has 3 bedrooms, an equipped kitchen and a living room. A continental breakfast is served each morning in the dining area. Upon reservation, guests can enjoy evening meals at the property. Free public parking is possible on site and an array of activities can be enjoyed on site or in the surroundings, including fishing, hiking and canoeing, and a golf course can be found 18 km away. Offering a sun terrace and views of the garden, La Clef Des Champs is located in Bennecourt, 48 km from Versailles and 6 km from the A13 motorway, which leads directly to Paris. Free WiFi is provided throughout the property and free private parking is available on site. Each room is equipped with a flat-screen TV. You will find a coffee machine and a kettle in the room. There is a shared kitchen at the property. You can engage in various activities, such as cycling and hiking. The bed and breakfast also offers bike hire. Giverny and Claude Monet's house is 8 km from the property, while Bonnières-sur-Seine Train Station is 3 km from the property. The nearest airport is Paris Beauvais-Tille Airport, 59 km from La Clef Des Champs. Offering a garden, Les Chambres Du Haras provides accommodation in Bernouville. Free WiFi is available. The bed and breakfast offers a seating area with a flat-screen TV and a private bathroom with a hair dryer and shower. Some units also have a kitchenette equipped with a microwave. Guests at LES CHAMBRES DU HARAS can enjoy a continental breakfast. The accommodation offers a children's playground. Beauvais is 41 km from Les Chambres Du Haras, while Forges-les-Eaux is 47 km from the property. Paris Beauvais-Tille Airport is 51 km away. Bed and Breakfast Tourny Preferred hotel ! With romantic furniture, all the heated rooms at Le Clos Saint Paul offer wooden floors and garden views. They also include a bathroom with free toiletries, a hairdryer and a bath or shower. A daily continental breakfast including homemade jams is served as a buffet at Le Clos Saint Paul. Evening meals are available on request in the dining room or on the terrace. This B&B offers bike loan free of charge. A sauna, walk-in shower and a chromotherapy hot tub are available and beauty treatments such as massages, skin care and body scrubs can be arranged. This property is a 10-minute drive from Andelys, Monet's Garden and the Château Gaillard can be reached within a 15-minute bicycle ride. Bicycles are available on site and a chauffeur service can be arranged. A shuttle is available from Vernon-Giverny Train Station, a 10-minute drive away, to Clos St Paul upon request. Below here is the hotels map of Hodent. Names and details of Hodent hotels can be shown on the map clicking on the prices icons.